Solace Black - Tropical Freeze 30mLA delicious combination of apple and watermelon with a hit of coo..
Solace Black - Strawberry Blast 30mLA fruity flavor punch loaded with strawberry and watermelon.Avai..
Solace Black - Sea Salt Blueberry 30mLA deliciously sweet mix of salt water taffy and blueberry.Avai..
Solace Black - Orange Cream 30mLSucculent tangerine and blood orange mixed with sweet fresh cream.Av..
Solace Black - Cool Mango 30mLA delectable fruity mango with just the right amount of cool menthol.A..
Solace Black - Banana Dragonberry 30mLA tropical twist with banana, dragon fruit, and fresh strawber..
Solace Salts - Creamy Tobacco 15mLCreamy, nutty, custard tobacco perfected!VG/PG: 50/50This flavor i..
Solace Salts - Strawberry Hard Candy 15mLAn instant Solace Vapor classic, Strawberry Hardcandy combi..
Solace Salts - Neked Peach Rings 15mLTry something new with Neked Peach Rings. Based on the unique c..
Solace Salts - Mint 15mLMint taste exactly how it sounds, refreshing mint flavoring and a creamy exh..
Solace Salts - Mango 15mLMango is a sweet and rich mango flavor that is perfect for anyone who enjoy..
Solace Salts - Lemonade 15mLA sweet and refreshing lemonade flavor perfect after a long day.VG/PG: 5..
Solace Salts - Dragonthol 15mLDragonthol is a minty flavor designed to replicate and appease the app..
Solace Salts - Lemonade 30mLA sweet and refreshing lemonade flavor perfect after a long day.VG/PG: 5..
Solace Salts - Neked Peach Rings 30mLTry something new with Neked Peach Rings. 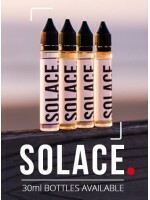 Based on the unique c..
Solace Salts - Mango 30mLMango is a sweet and rich mango flavor that is perfect for anyone who enjoy..
Solace Salts - Mint 30mLMint taste exactly how it sounds, refreshing mint flavoring and a creamy exh..
Solace Salts - Strawberry Hard Candy 30mLAn instant Solace Vapor classic, Strawberry Hardcandy combi..
Solace Salts - Dragonthol 30mLDragonthol is a minty flavor designed to replicate and appease the app..